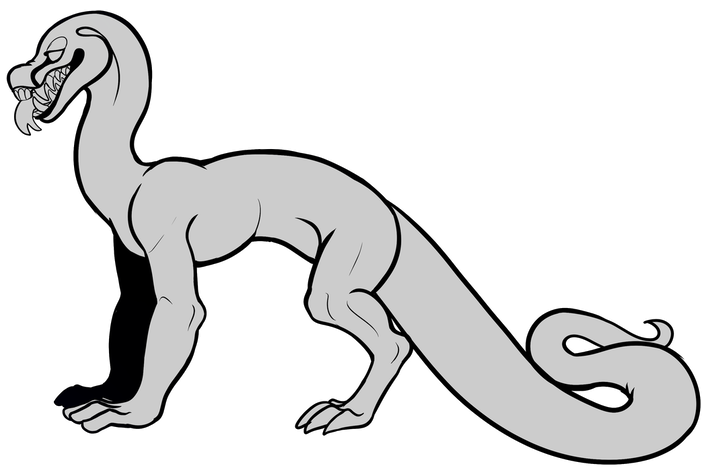 Vido are quadrupedal dragonlike creatures with long, seemingly boneless tails. Most of them have humanlike front hands and holes for ears -- some are known to have earflaps or mammal-like ears though. Their hands are humanoid and dextrous, though most of the time lacking real nails or fingerprints. Vido can learn how to write or draw surprisingly fast using these hands. They are known to generate with a huge variance in body shape and attachments -- for example, one may generate with antennae and small soft spikes down its back while another generates with ears and spikes similar to a lionfish’s. They have one pair of medium-sized eyes with a slit pupil and colorful iris -- most of the time this pupil is hidden and the eyes are blank, as they turn pure white when they are projecting sight. Wild Vido usually always have blank eyes, while tame ones use their normal sight primarily. Most Vido also have a black marking that comes from the corner of the eye and curves down the snout, like a tear streak on a cheetah. A trait that stays the same across almost all Vido is the teeth -- they have flat horselike incisors in the front of their mouth, and four larger canines right behind those, followed by molars. When a Vido’s mouth is closed completely, the front teeth are often still visible. (The lips on the front of the snout curve upwards and do not reach all the way to the bottom jaw.) Vido can also have a variety of face shapes. The diversity of Vido comes from slight corruption when spawned, which causes the “instructions” for the Vido’s face to be muddled. A Vido’s face can also be slowly mutated to match their personality over time! If you were to cut open these creatures, you would find that their flesh is composed of an almost jelly-like substance -- it's thicker and less viscous around the arms and legs, but near the core and in the tail it gets very gooey and slimelike. Strangely the inner flesh smells nothing like its name would imply. Some find the scent sweet and calming, while others say it causes their thoughts to become vivid yet muddled. Ingesting it has various effects depending on the creature, and isn’t recommended. Around joints like the elbows and knees the flesh is very hard and almost rubbery. Healing rate varies between creatures -- most have normal humanlike healing speed while others can patch themselves up almost instantaneously. If cut, the inner flesh gel oozes out and hardens until it becomes skin-like again for shallow wounds. The gel will leak out faster and longer if the wound is deeper and in an area where it is more liquid. Some Vido tend to scar while others heal without any indication of the wound that was ther. Amputation is harder to heal, and most with normal magic levels do not recover any amputated limbs.